The London 2012 Olympic and Paralympic Games took place from July to September 2012. Both events were tremendously successful, generating popular enthusiasm in abundance. The London 2012 Games were the latest chapter in London's long history of involvement with the Olympic movement. London had hosted the modern Olympic Games twice before - in 1908 and 1948. The Museum of London's collections reflect something of these spectacular events. The 1908 Olympic Games took place at White City in Shepherd's Bush, in the great, new stadium built by the entrepreneur Imre Kiralfy. The Museum holds the Kiralfy archive and most of the items we have related to 1908 come from this source. The 1908 Olympic Games had their share of controversy. This was the first occasion where national teams competed, rather than individual athletes, so national pride was at stake. Accusations of unfairness and cheating dogged many of the events, most notoriously in the marathon race. Here, the exhausted Italian athlete Dorando Pietri was helped over the finishing line by officials to win his gold medal, only to be disqualified the following day after protests from the American team. From the point of view of the British team, the 1908 Games were the most successful ever: Great Britain topped the medal table with 146 medals, almost 100 more than the United States which took second place with 47 medals. 22 national teams competed in 1908. The 1948 Olympics were held in the aftermath of the second world war and were organised on a shoestring. Rationing was still in place, and the Games became known as the 'Austerity Olympics'. Competitors stayed in RAF camps and schools, and were transported to competition venues in old London buses. No new venues were built for the Games, which used existing stadiums, chiefly the Empire Stadium at Wembley which had been built for the 1924 British Empire Exhibition. Some of the Museum's items from 1948 were given by the Organising Committee, as they wound themselves up in 1949. They were anxious that official items, such as surplus medals, should not fall into the hands of souvenir-hunters. The 1948 Olympics did not give any new buildings to London but cheered Londoners up after the years of war. The United States topped the medal table with 84 medals. Great Britain came 12th with only 23 medals. 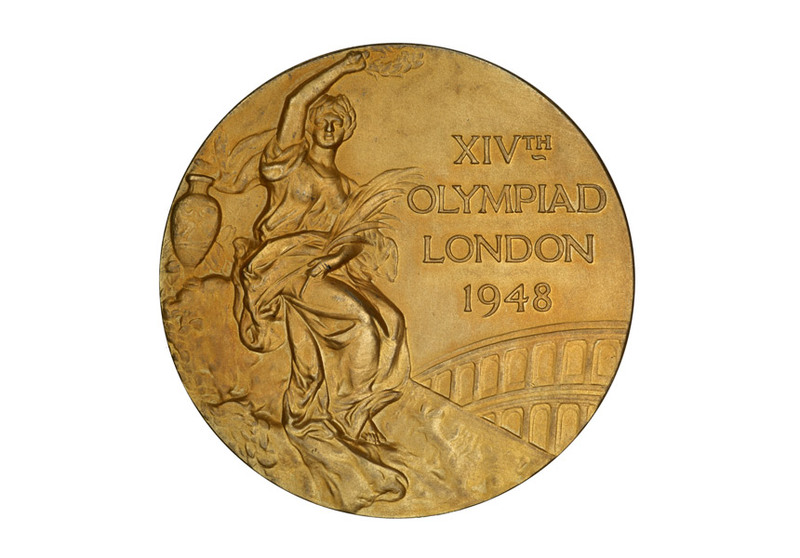 The 1948 games also led to the foundation of the Paralympic Games. To coincide with the 1948 Olympics, Stoke Mandeville hospital organised the first sporting competition involving war-injured patients. Today the Paralympic Games are a central aspect of the Olympic movement. The Museum of London began to discuss ways of 'collecting the Olympics' in 2005 when London won its bid to host the 2012 Games. A first initiative was to record the firms and business in Stratford to be displaced by the construction of the main Olympic Park. At the same time an oral historian recorded the views and life-stories of people on the Clays Lane Estate. Artworks were acquired from artists living near the Olympic Park. Collecting of general Olympic-related material continued before, during and after the period of the games, yielding a quantity of souvenirs, flyers, newspapers, badges, and leaflets. The Museum also acquired a selection of outfits ? from the purple and pink outfits worn by the volunteer ?Games-makers? to Team GB track kit and the eye-catching red trainers. Perhaps most exciting of all is the yellow jersey worn by Bradley Wiggins in his role in the opening ceremony. Other outfits from the opening and closing ceremonies include giant punk heads, a blue bowler hat with light bulb, a Mary Poppins outfit, clothes covered in newsprint and around 50 other outfits and accessories. The summer of 2012 also saw the Museum?s first social media collecting project - #citizencurator, a partnership with the University of Westminster. By the close of the London 2012 Olympic Games, Great Britain was ranked third in the medal table, with 29 gold medals, 17 silver and 19 bronze. In the Paralympic Games, Britain?s team also ranked third, with 34 gold medals, 43 silver and 43 bronze. London 2012 also left a massive physical legacy in East London - new sporting arenas, newly-constructed neighbourhoods, infrastructure and a spectacular new park with the tallest public artwork in Britain ? the 115 metres high Orbit. These changes will continue to affect the whole of London for many years to come.